Biography: Angela Greco was born in Cosenza, Italy, in 1980. She gained her degree in Assyriology in 2005 at the University Sapienza of Rome, with a dissertation on the cuneiform writing system. Thanks to a scholarship of the Sapienza for specialization studies post lauream, she spent 6-months at the Instituto de Lenguas y Culturas del Mediteràneo y Oriente pròximo of the CSIC of Madrid. In 2013 she got her PhD in Assyriology in co-tutorship between the University Sapienza of Rome and the Freie Universität of Berlin, with a dissertation on Sumerian economic texts from the last century of 3rd Millennium. As research assistant at the Freie Universität, she worked in the field of the historical epistemology regarding to the early periods of the cuneiform script. 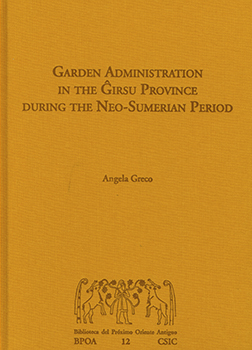 Her PhD dissertation, revisited and translated in English, "Garden administration in the Girsu province during the Neo-Sumerian Period", will be published as the 12th volume of the BPOA series. The present work aims at examining the management of gardens, in particular palm groves, in the Girsu province during the third dynasty of Ur, also known as the Neo-Sumerian period, a period spanning the last century of the third millennium BC. As is well known, agriculture was the economic fulcrum of Lower Mesopotamia in third millennium BC, assuming various forms according to the different landscapes of the alluvium, and garden culture was just a part of this broader framework.